VR requires serious hardware and Eurocom delivers. 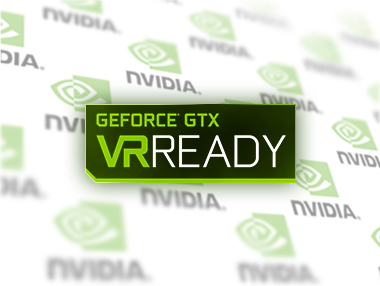 Get the hardware you need to work with VR. Explore the power and potential of Virtual Reality. Interact with new worlds like never before. Create your own VR laboratory, with a Eurocom VR Ready laptops. Unleash your creativity in the fast-emerging field of VR development. Eurocom's powerful laptops are state-of-the-art systems that go hand-in-hand with the latest VR headsets. Take advantage of VR's potential to produce the most compelling and immersive interactive experiences imaginable. Virtual Reality or virtual realities (VR), wich can be referred to as immersive multimedia or computer-simulated reality, replicates an environment that simulates a physical presence in places in the real world or an imagined world, allowing the use to interact in that world. Virtual realities artificially create sensory experiences, which can include sight, touch, hearing, and smell. Virtual Reality is an exploding technology that has countless uses across many industries and markets. VR works by using sophisticated and powerful computer technology to create a simulated, three-dimensional world that a user can manipulate and explore. Furthermore, the main goal is to allow users to interact with the virtual reality as if they were in that world. Specialists have designed numerous applications, devices, and technological innovations to make this goal a reality. In order to provide a truly immersive VR experience, the technology should include life-sized, three-dimensional images as well as the ability to track the user's motions, particularly his/her head movements, and adjust the displayed images to reflect a change in perspective. In order to accomplish all this, and to perform smoothly, VR requires powerful hardware – hardware that most laptops cannot provide, but that Eurocom supercomputer class laptops can. Professionals can now recreate, life-size virtual, interactive prototypes of their work. Designs can be optimized by creating a potentially very low-cost, life-size prototype and then evaluated by engineering and design teams; Clients can be shown the work they have commissioned and have designs altered before the final product is delivered, minimizing alteration costs. Problems can now be eliminated before they manifest in designs; final products can be run through simulations that can be observed in real-time, in a life-sized representation. There are many more applications than this and, suffice to say, VR will leave its mark on the design/engineering industry as well as many others. VR has some unique benefits to the health industry, and we have only scratched the surface. As mentioned above, VR can greatly enhance the training of medical professionals. For example, surgeons can practice their craft in a life-sized, virtually immersive and responsive environment at lower cost and improved efficiency compared to current methods of exposure, one operation at a time. In fact, UBC master student, Dirk Haupt, is currently working on a project where he hopes to use virtual reality as a revolutionary form of rehabilitation for spinal trauma victims who have lost, or partially lost, the use of their extremities. VR will allow neurosurgeons to examine the neural activity of patients who have endured such trauma so that they can potentially be cured of their ailments. Virtual Reality is being incorporated into military bodies, including the army, navy, and air force. VR is particularly useful for training soldiers and officers in combat situations and other dangerous operations where learning how to react is vital to a successful mission and soldier survival. Numerous aspects of Military personnel training can be can be enhanced using VR. Some examples include weapon drills, tactical response, hostage situations, enemy disposal, demolitions, package transportation and more. The obvious appeal of VR is that users can create hostile situations without risking physical harm to soldiers. In addition, over time, VR also allows military bodies to save on training costs since objects, enemies, and weapons fire can be emulated at no further financial or personnel costs. One of biggest commercial uses of VR is recreationally. From games to martial arts training, VR provides an immersive, adrenaline-pumping experience for all recreational uses, and there is already considerable hype over VR games like Star Wars, which promise to lay the carpet for an entirely new recreational experience. VR also blends the line between gaming and fitness training, as both activities will now involve interactive opponents that respond in real-time to your every real-life move. Whether it’s for martial arts, or watching a life-size virtual personal trainer, VR will change the game in recreation and fitness. VR presents ground-breaking innovations to the realm of education. It can bring high school students from their classrooms to far away countries and cultures. Students can see first-hand the workings of massive machinery or world wars; they can watch, as if standing on the very ground they are studying, as climate change ravages different global environments, giving them a true appreciation of their duties to the next generation and to the planet they call home; they can visit foreign classrooms and learn about ancient cultures and practices. But, most of all, students can create. Students can create in their own world – true form of differentiated instruction if there ever was a universal definition of the term. Students can create their own projects instead of writing about them; they can develop and explore all the skills that go beyond writing, reading, listening, and presenting. Almost anything imaginable will be within reach to students enrolled in a class with VR. Secondary students can experience the same benefits from the technology, but through much more focused applications. Any faculty can use VR to bring student education to the next level. From practical, hands-on training, to historical recreations, to simulations, to individual creations, students will have access to a whole new, immersive world and untold possibilities that will expand and renovate the very foundations of post-secondary education. Explore new frontiers and share your VR experience with the world. 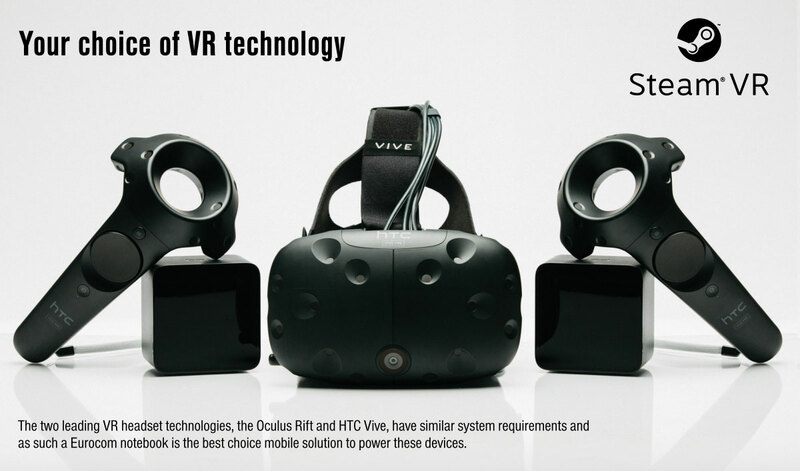 Use the leading engines and developer tools such as Unity, Unreal Engine, and OpenVR SDK from Steam VR. Getting started on creating the future is as simple as getting the right hardware, downloading necessary tools, and hacking together your masterpiece. The most creative minds in the world will be driving the most immersive virtual reality experiences. 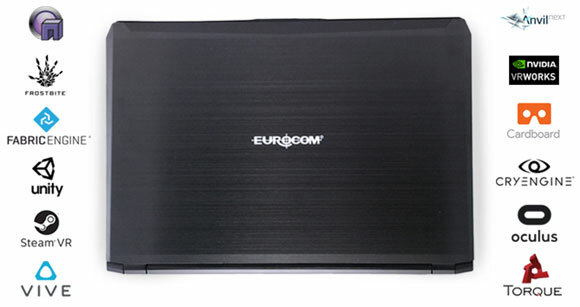 Eurocom is focused on providing developers with the most VR Ready laptops. Join the revolution, become a developer today!